Welcome to my first of two pillow tutorials! I first shared this one a few weeks back at The Crafty Bee, a sweet blog written by an equally sweet gal from Montreal! 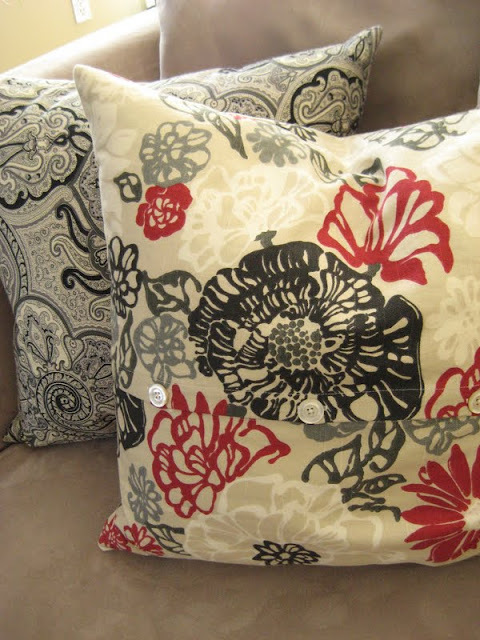 Accent pillows are the greatest way to add colour, texture and inject some trendiness into your home. And they don't cost a lot to make, usually one pillow requires about 1/2 yard of fabric. So to splurge on a some high end fabric for one pillow can be feasible! I had a fabulous high school sewing teacher who taught me all I know. I always say to anyone who is discouraged and intimidating by sewing, "If you can sew a straight line, you can sew." All it takes is patience, time and a good iron. Why a good iron? 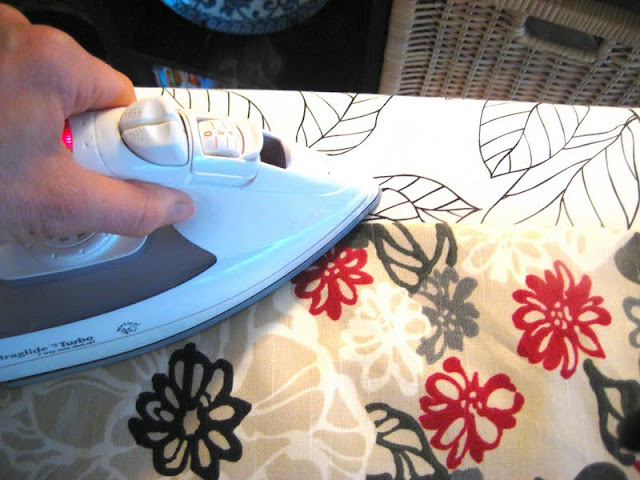 Using an iron throughout makes your project look crisp and professional. The key to a good pillow is to pick the right fabric. Make sure you use a good upholstery weight fabric or heavy cotton. This will ensure a nice crisp pillow. 1. Measure your pillow insert. For front side of the pillow add 1" to both sides. This will allow for a half inch seam allowance. For the back side you will cut two pieces that will create the envelope back enclosure. For the width, add 1". For the height, add 4". 2. You will now iron and sew a hem on the wide edge of the two pieces. Fold over 1/2", then another 1" to create a hem, this will be where they overlap to create an opening. 3. 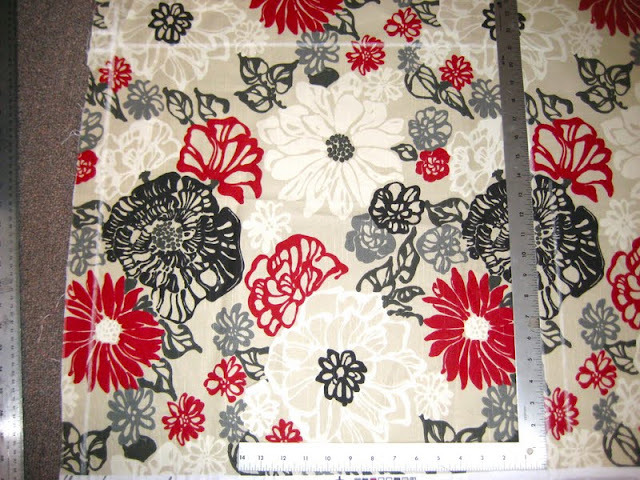 Overlap and pin the two hemmed edges as shown in picture. 4. You can either stitch the edges of the enclosure to create an opening OR if you want the Sarah Richardson look you can sew buttons and buttonholes to keep the enclosures closed. Measure where you want your buttons to lay. I used three buttons. A rule I learned in my short stint at fashion design school was odd numbers look best to the eye. 6. Sew the buttonholes, on one piece along the hemmed edge. Snip open. 7. Sew buttons on other hemmed edge, lining up with the buttonholes. 8. Mark and stitch the opening of the back. 9. Lay the front and back pieces, right sides together, matching corners. Pin and stitch along all four sides. I then trim the corners and zigzag the edges of the seams. 10. Turn right side out and iron to give a nice crisp edge. 11. Insert pillow and then voila! Hope you will try to make one for yourself! On Friday I will show you how to make a pillow with an invisible zipper! Beautiful Barbara. I can't wait for your invisible zipper tutorial! Very very pretty! I love the fabric you chose! Nice pilows and great fabrics you selected. I totally agree that the right fabric makes the pillow. I tried to cheat recently and use a lightweight fashion fabric. It's itchy and droopy. thanks for the step by step - looks fabulous! And if you have lightweight quilting fabric you love, just iron on some fusible interfacing to bump up the weight of the fabric. Thanks for the awesome tutorial! I'm going to try that for sure!